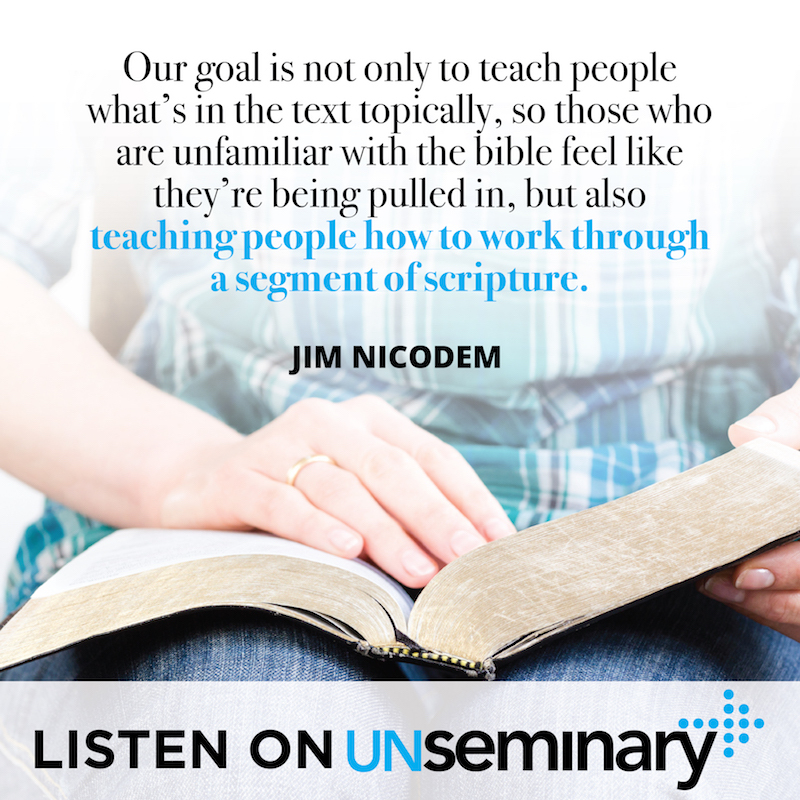 Hey, everybody, and welcome back to the unSeminary podcast. Thanks for listen in as we speak with Jim Nicodem from Christ Community Church. Christ Community Church is located in Chicago and has four locations, with about 5,000 people attending services there. Jim has a passion for teaching God’s word and he is one of the original founders of Christ Community. Listen in as Jim explains how Christ Community is combining elements of an attractional model church with depth of discipleship and how you can do the same in your church. You don’t have to choose between attractional and theologically deep services. // The problem with choosing one or the other, as Jim explains, is that you can be at one service that’s focused on attracting unchurched people and yet it may make you wish it had more substance. Yet then when you’re at a service focused on the theological depth you may wish for something that you could more easily invite an unbelieving friend to. At Christ Community Church (CCC), they aim to learn from both methods. CCC has a very attractional model of church with outreaches and relevant services that engage people who aren’t familiar with church. But when people accept Christ, CCC also works hard to get these people plugged in on a deeper level into God’s word. Blend topical and expositional teaching to attract the most people. // Some pastors are gifted speakers when it comes to topical teaching and attract a crowd with these sermons. Others focus on expositional teaching and may go through a certain book of the bible, verse by verse. Jim says they try to blend the two at Christ Community Church. “We approach things probably 80% of the time from a topical standpoint, but every message we preach is rooted in one single text.” This approach helps people not only work through the bible, but also work through that section of scripture and read deeper into it while applying it to their lives. Find a way to blend contemporary and liturgical. // Christ Community Church is a contemporary setting with a lot of energy, but when visiting other places Jim found himself choosing more liturgical churches. He thought, “Why not try to blend the two modes of worship together in a service?” After studying how other churches around the country are trying to accomplish this mix, Jim made some discoveries that he brought back to CCC. Contemporary services tend to be focused on expressing faith, while liturgical services are focused on shaping faith. The first step Christ Community took in blending the contemporary and liturgical methods was to include a teaching pastor onto the worship planning team. Adding another viewpoint to the mix enabled CCC to choose songs that were not only high energy, but also theologically solid and matching the teaching of the message. In addition Christ Community began to create moments of quiet in between the rocking music to allow for prayer, confession or reflection. Create a clear path of discipleship. // Christ Community Church also creates clear on-ramps for discipleship to happen depending on where people are spiritually. Additionally once people move into community groups, CCC wants to make sure depth happens. So while they operate on a free market system for these groups, they also ask that group leaders choose curriculum that isn’t just topical, but also covers a book study of scripture at least every other study. Lastly, to help train leaders as they spiritually shepherd their groups, Jim has written a four-book Bible Savvy series which can also be used for study in the group. You can learn more about Christ Community Church at their website www.ccclife.org. You can also reach Jim at [email protected] and pick up his four-book Bible Savvy series on Amazon. 00:40 // Rich introduces Jim Nicodem and welcomes him to the show. 01:11 // Jim gives us a flavor of Christ Community Church. 02:12 // Jim talks about attractional ministry. 04:20 // Jim talks about their teachings and series. 07:55 // Jim tells us the difference between contemporary worship and liturgical worship. 11:55 // Jim tells us how they make ‘quality discipleship’ happen. 17:34 // Rich highly recommends Jim’s 4 book series to other church leaders. 19:05 // Rich and Jim discuss small groups. 21:25 // Jim takes us through Christ Community Church’s 4 asks. 23:17 // Jim offers his contact details. Rich – Hey everybody, welcome to the unSeminary podcast, my name’s Rich, the host around these parts. I am so glad that you’ve decided to spend some time with us today, honored really, I know things are really busy at your church, you’ve got a lot going on this week, as we get ready for this weekend, so we’re just honored that you would take some time out, pop us in your earbuds, to listen in on today’s conversation. Today it’s our privilege to have Jim Nicodem with us, from Christ Community Church, a great church leader, a great church. Jim welcome to the show. Jim – Thanks Rich, it is good to be with you. Rich – Yeah, for folks that don’t know, Jim was actually the founder of this church, a few years ago, back in the mid-80s when he was 3 years old. So it’s a great church, about 5 thousand people, 4 locations, in the Greater Chicagoland area. Jim why don’t we start with you kind of giving us a flavor for your church, tell us about Christ Community. Jim – We like to describe ourselves Rich as a seeker church with depth. That’s our unofficial moto, it sounds cheeky to say it. So we don’t put it on our literature, but we come out of a Willow sort of background, our roots go back to a close connection with Willow Creek. A strategy of attracting people who are spiritually lost. But at the same time my passion is for teaching God’s word, I’ve got a Biblical Studies Undergrad Degree and then a Masters and Doctorate in Hermeneutics. So I’m really passionate about people getting roots down into God’s word. So we want to take them somewhere, once we lead them to Christ. So that’s the general flavor of who we are. Rich – Okay, very cool. Now, for people that may be listening in, they may think that those are an apparent contradiction, being both kind of attractional and really identifying with a movement like Willow Creek, but then at the same time trying to have a high, high, kind of desire to disciple people. How is that possible? How is it that you’re doing that at your church? Jim – Yeah it’s a great question and we have felt sometimes like a fish out of water. You go to some conferences that are all about attractional ministry. So if you’re at Willow, you’re at Northpoint, you’re passionate about reaching the lost, but you’re sitting there thinking, “Wow, I wish I heard some stuff that was theologically just a little deeper, stretching me in that area.” So you go to a Gospel Coalition, you go to a John Piper conference and you’re, “Buy me that stuff,” but you’re thinking to yourself, “Wow, I wish there was a passion for reaching lost people,” and you kind of feel lost between two worlds. We just found that you can do both. So for example, on the attractional side, we’ve just come through a very busy December, at the beginning of the month we do an outreach, at the end of the month we do Christmas Eve services, like everybody else. From an attractional standpoint, we had about 170 some people come to Christ through December. Rich – Wow that’s amazing. Jim – For us, we don’t count people who just raise their hand or stand on their feet, unless they’re willing to go to our Welcome Center, at one of our four campuses and pick up a Next Step Packet, as a sign of their determination to follow Christ, we don’t count. So one of our campuses, during invitations that were given during the Christmas Eve services, 70 some people stood but only 3 or 4 people picked up Next Steps Packets, so when I say we have 170 come to Christ, that’s only the Next Step Packets. So we’re highly attractional, but again, in our ministry we’re rabid about discipling people and getting their roots down into God’s word. Rich – Interesting, you know, I think there’s a growing trend of what your church has tapped into, I think there was a false economy at one point, between those 2, obviously you’ve set that up as an interesting conversation, but I think, as we’re seeing churches that are growing, they really are trying to do both and do them well. The thing I love about Christ Community is you seem to have found some things that are working in your context, so clearly your church is growing, you’re reaching people, how do you do the big D word, discipleship, what does that look like at your church? Jim – Good. Let me start with the most prominent, the tip of the iceberg that everybody sees at the weekend service, that’s the preaching. Jim – So from a preaching standpoint, again working on a hybrid model, we look out there, there are those who are big advocates of topical teaching. So if you teach topically, you tend to attract a crowd that has come for the topic, whatever it is; It’s a parenting series, it’s a marriage series, whatever. On the other hand, there are those who are real advocates of expositional teaching; We’re going through the book of James and we’re doing verse by verse by verse. We try to blend the two, so we approach things, probably 80% of the time, from a topical standpoint, but every message that we preach here, is rooted in one single text. So we don’t jump around proof texting. This week a perfect example, we’re doing a series called Back to Plan A, God’s Countercultural Wisdoms. So we’re looking at the issues where our culture has drifted away from Judeo Christian roots, failed use, and we’re calling our people back to those and those biblical values. So we’re hitting on a variety of topics. We’re hitting on racism, a Martin Luther King Jr weekend. We’re hitting on the Sanctity of Life, we’re doing something on abortion. But every time we hit on a topic, we draw from one particular text. So this weekend the topic is Materialism, our preaching through a segment of 1 Timothy 6. Our goal is not only to teach people what’s in the text topically, so those who are unfamiliar with the bible, those who are seeking exploring the faith, feel like they’re being pulled in, but also teaching people how to work through a segment of scripture. So rather than being impressed with me at the end of the sermon like, “Wow that guy brought me here, there, everywhere around the bible,” all I did was walk them through one text and they’re able to say, “Oh that spoke to me. I can do this. I can go home, open a bible, read a passage.” We’re just teaching basic rules of how to study a book within their context. So that’s the blood, that’s the hybrid doing text topical teaching. Rich – That’s very interesting. I love that. Now is there kind of a time of year that you would actually take out and say, “We’re actually going to go through this book. We’re going to follow this narrative.” Do you do that as well when you blend it? Is that kind of what you’re doing? Jim – We will do, maybe 20% of the time, we will do a more purely, walk through a segment of scripture. So an example of that is, in late November and in the month of December, we did a series in Hebrews but we treated it topically, we called it Picture Perfect, Images of Jesus and the Book of Hebrews. You’re familiar with Hebrews. We sent a week talking about Jesus as exalted above angels. We talked about Jesus as the High Priest. We talked about Jesus as the perfect sacrifice. We talked about Jesus as the Sabbath rest. So we walked through large segments of Hebrews during the course of that series, but it was treated kind of topically because of the way we approached it from week to week. We’ll do the same thing leading up to Easter. We’ll sometimes say, “Okay, we’re going to walk through the chapters in Matthew that cover Passion Week and we’re going to do a 5 or 6 weeks’ series on it. So those are the kinds of textural series and more purely textural but we’ll do some topics. Rich – Very cool. So you mentioned that as one piece of the discipleship puzzle. I appreciate you starting there, because I think a lot of times we just take that for granted. Other pieces of the discipleship puzzle at your church? Jim – Yeah, worship. So I’m still parking on the weekend service, that is the main point of contact that people have with us. Again, we just work on a hybrid model. Rich – Peel the paint off the walls. Melt your face. All that, yeah. Jim – Exactly, and I am, Rich I love music, I love that kind of worship, but the flip side, at the other end of the spectrum, a more liturgical worship, you go into a church that’s got liturgy and there are creeds and there are times of silence, times when sin is being confessed, there are reams of scripture that are done antiphonally and so on. Seriously, when I get away from Christ Community, I gravitate towards a local Anglican church that’s very evangelical, because it’s so different. So there are people around the country that are trying to do this and have gone to school on. One of those guys Glenn Packiam, who’s a worship leader out at New Life in Colorado, a contemporary artist, got a band, cooking band, whatever, but he’s now leading a worship service that’s largely liturgical. So the dude knows how to blend the two and so I’ve gotten to school on Glenn and on others and one of the things Glenn teaches is that worship is not just a faith-expressing activity but it’s also a faith-shaping activity. Much of contemporary worship is all about expressing. Rich – Yes, declaring, yes. Jim – It’s all about hands lifted up, again raised to the roof. In liturgical, it tends to be shaping, we’re doing these repetitious things, because it’s kind of a teaching component of the service. So, one of the first things we did in that regard is, we moved a teaching pastor onto the Worship Planning team. So you’ve got to get everybody used to the fact that, yeah there’s going to be some stop and starts sort of thing, things going on. It means organizing the worship around a theme, a theme that fits possibly with the sermon of the day. Sometimes our theme is just the gospel. Our worship follows the creation for redemption restoration, an outline of the gospel. So that’s another way we’re trying to deepen people in a commitment to Christ, make disciples out of them, it’s through worship that’s got some depth to it. What else are you doing to think through the discipleship piece at your church? Jim – Probably the most obvious one, and I’m sure everybody listening to us in church world is doing the same thing, it’s the use of small groups. We call them community groups. 75% to 80% of our weekend attendees are involved in a community group. Rich – Yeah, right absolutely, that’s incredible. Jim – So one of the things that’s helped us in that regard is, and we picked this up from Greg Hawkins book Move. Greg was the Executive Pastor at Willow for years and they did that whole Reveal study, that they weren’t taking people to depth in faith. So what some people may not be aware of is that subsequent to Reveal, Greg did a study of a thousand churches that were making it happen, discipleship happen, to find out what are they doing, what is successfully doing on in these churches? And one of the things he discovered is that they have a clear path of discipleship and it’s not so important down the road a little distance, where you give people options, but initially the first two or three steps have got to be clearly spelled out. There has to be clear on-ramps for how people get started. So for us, before we get people into group, there’s 3 on-ramps and depending on what condition you come spiritually to our church, you’ll choose one of those. So if you’re still exploring the faith, your on-ramp is alpha. We want to get you into alpha, find out about what Christianity is all about. If you come to us and you’re just making your faith decision. You’ve come to the church, you’ve picked up a Next Steps Packet and now you’re a believer, we want to get you in a Next Steps class. So it’s a class that you’re on-ramp. If you’re coming to our church because you’ve just moved from San Diego and you’re a Christ follower and you’re coming from an Evangelical church, we’ve got a course called Begin to Belong. So we’ve got clearly marked on-ramps, depending on where you’re at in your spiritual journey for how you get involved. Then after that it’s community groups, we get you in a group. Rich – I think the important thing to underline there for people is, and we’ve seen this time and time again, we’ve taken kind of a focus on unSeminary, talking with churches, fast growing churches that are doing a good job integrating things, people, and time and time again the thing that comes back is clear and obvious, particularly first steps. Rich – That has to be so obvious, so strategic. Rich – You can’t have, “Here’s 10 different things.” There was a time in ministry where it was great to brag, “We’ve got 101 ministries,” that day is done. We’ve got to have very, very clear steps. You went through there and described, really everyone who could potentially ever come to your church; “Here’s 3 places you could go to.” If you can’t do that church leaders, that something you need to work on for sure. Now the actual community group experience, when people land there, what does that look like at your church? 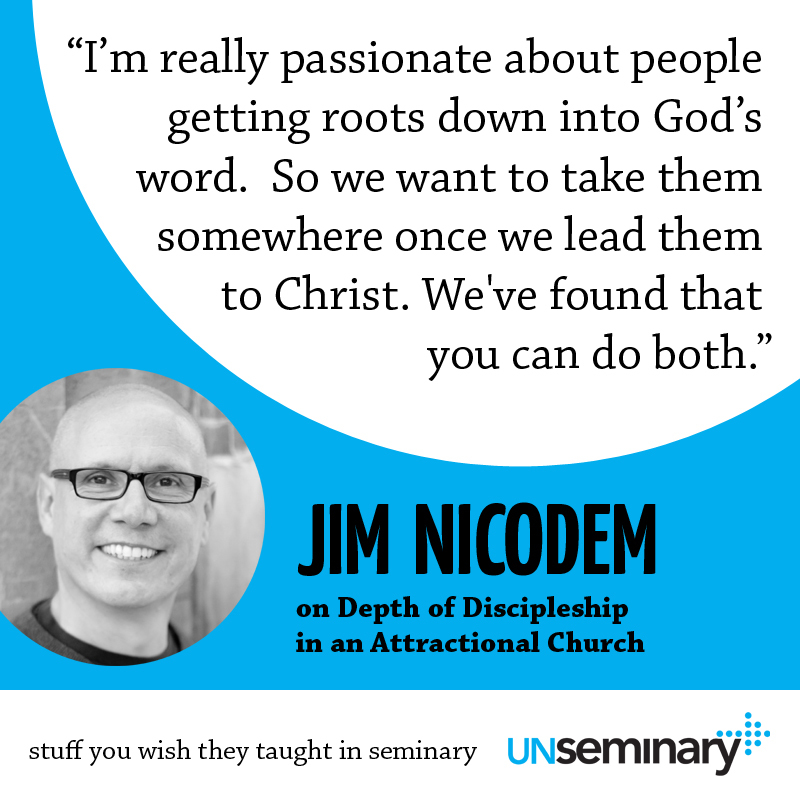 Jim – Yeah, here are several ways we’re trying to make sure that depth happens, that discipleship happens. One is, we ask our groups, at least every other study, it needs to be a book study of scripture. So it’s so easy to gravitate toward topical studies, and sometimes there’s depth to them, sometimes there’s not depth to them. 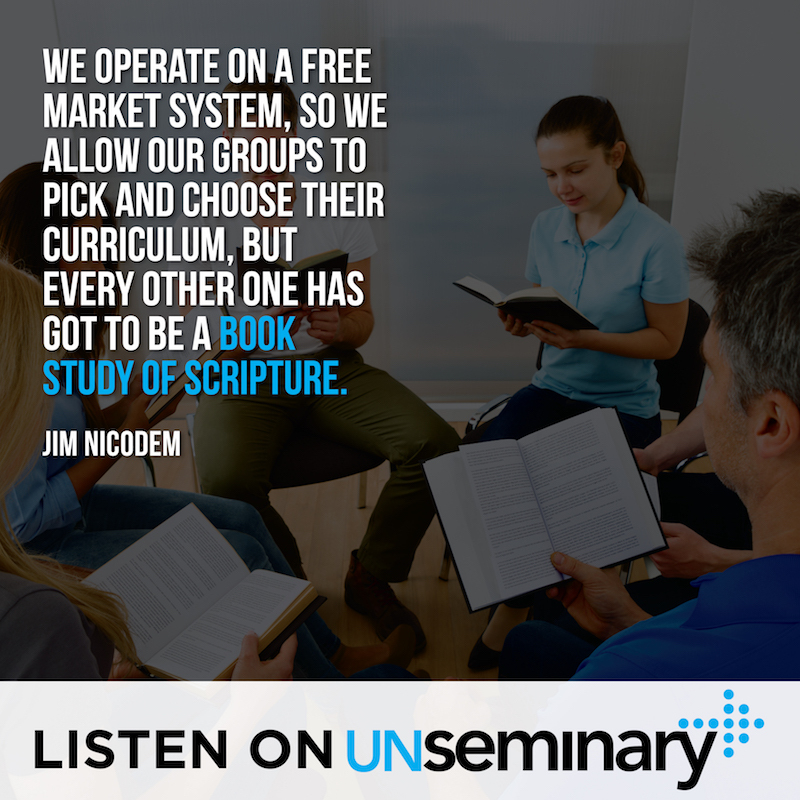 We operate on a free market system, so we allow our groups to pick and choose their curriculum, but every other one has got to be, “Hey, we’re going through the book of proverbs,” or “Hey, we’re studying the life of David in 1 and 2 Samuel,” something like that. Then secondly, even the free market opportunities they have, we try to guide them in the choice of their curriculum. So we sift through, we filter through, “Sorry this curriculum, I know it’s popular out there, but no, it’s cheesy or it doesn’t have biblical depth or whatever.” So we’re kind of careful in what we give people. Then lastly, we try to train our leaders really well and one of the things I’ve done in that regard, Rich, is a couple of years ago, I wrote a 4 book sequence for Moody Publishers; Bible Savvy. We woke up to the realization, we got over 300 small groups going out, we are trusting the spiritual shepherding to these leaders. What do we know about their bible acumen or about their knowledge of Old Testament, New Testament, basic hermeneutics etc? So I wrote this 4 book series specifically for community group leaders. So book 1, called Epic, covers the bible storylines. So Genesis, Revelation. It’s a real simple flow of the Plan of Redemption through scripture. Second book is called Foundation and it’s the apologetic issues, how do we know if the bible is a credible book? It’s kind of Lee Strobel-ish..
Third book is called Context and it deals with basic hermeneutics. If you’ve read Gordon Fee’s book, How to Read the Bible for All Its Worth, this is putting the cookies at an even lower level, [Inaudible 00:16:57] level. It’s basic hermeneutics. Then the last book, Walk, is how do you take what you’ve read and put it into practice? So those 4 books, they’re short books, they’re like 4 or 5 chapter books. We have had them bound, Moody’s bound them in a 4 book set and we made sure every single one of our leaders has them and many of the groups decided to use them as their curriculum in their group studies. Jim – So just again, another way of ensuring that there’s a quality of discipling going on in our small groups. The thing I love about this resource is, like you say, you put the cookies on the bottom shelf, in a way that’s accessible for folks, that they then can turn around and lead with excellence. So I would strongly recommend, we’ll put links in the show notes of how to get that and all that, but I really would suggest you look into that for sure. Jim – Yeah, I have some obvious biases, but I’ll just go back to some of the things I’ve already said Rich. I’d say, for a pastor it starts with your preaching. If you want to wet people’s appetite for God’s word, then preach through one text. Even if you’re a topical teacher, even if you want to do an attractional model, so you want to do topical series that draw in outsiders, determine that from week to week you’re going to choose one share text that you sit in. So it accomplishes two things, you teach the topic but you also teach people how to study the bible. You wet their appetite for wanting to do it. So I think that’s a huge way to begin. Role modelling? It always comes back to the pastor having to be the poster child for whatever the value is. So if you’re going to get people into a community group, into a small group, you’ve got to be leaking it all the time, that you are in a group. Rich – Come on, that’s not true. Senior Pastors don’t need to be in groups. Just kidding obviously. Huge. Jim – Yeah, one group after another, over 30 years of ministry at Christ Community Church, I am passionate about discipling them and I love to be in a group that’s always got 1 or 2 guys at least, who are not yet, they haven’t crossed over the line, they’re not yet surrendered to Christ. 1 or 2 guys who are new believers, this is the first time they’re cracking the bottle on a bible. Then that leaks into my sermons through illustrations. I’m referring to my community group and something that somebody shared in it. That stuff is caught as much as taught. So you could beat the drum for community groups, but unless you’re demonstrating that you’re involved yourself, it’s not going to be picked up by them. Rich – that’s a huge lesson. I know there could be people, there are senior leaders today that have heard that before, but I’ve seen that in action, time and time again, when a senior leader gets up it’s not in the once a year sermon around why you should be in a community group, no, no, no, it’s not in them, it’s the sentences here and there; “Hey, this week we were out with our life group and this is a question that came up. Wow that was amazing.” Or, “I was talking to this guy in our community group and he asked this question and I’m excited about that.” Or, “We went and served together at the Soup Kitchen and man that was such a great experience and let me tell you this funny thing that happened.” Those small pieces drive people to think, “Gosh, maybe I should be a part of one of those.” So great. This has been a great conversation. I really thank you so much for taking time out. Is there anything else you want to share before we wrap up today’s episode? Jim – I think we’ve covered it. One other piece that we’ve done or thrown in, for years now we’ve been moving people along the lines of 3 asks. So we ask you to be here at weekend service, that’s really critical. We ask you to serve in some way and we ask you to get into a community group. We’ve just added a fourth ask and again it’s helped us organize all of that stray stuff. So how do we get people introduced to the Old Testament? And the New Testament, how do we get them introduced to basic hermeneutics and whatever? We realized, if we try to do that strictly through community group curricular, it’s just very limited. We have to do some seminar teaching. So how do we start throwing those courses out there without it mudding the waters, and now it sounds like 14 asks? So what we’ve done is we’ve taken all of those seminar type courses that we’re teaching, you know, biblical, parenting, evangelism, training, all of that stuff and we’ve put it in a fourth category, we just call Training. So we’ve asked people, we basically operate in a 3 semester a year, you know, there’s fall, then there’s winter and then there’s spring, then there’s summer. One of those semesters, do one thing training wise. Jim – So come on the weekend, find a place to serve, get in a community group, but fourthly, do something by way of training. So coming up with that fourth category, like a stool if you will, it’s been really helpful, it’s been a way to organize steps, so again it doesn’t sound like we’re asking 14, 17 things of you. That’s the 4 basic things, but that last, catch all category, helps us to hit on all the important training stuff. Rich – Very cool. Well this has been fantastic. Jim, if people want to get in touch with you or with the church, how can they do that? Jim – Feel free to email me at [email protected]. I’d be happy to respond Rich. Rich – Nice, thanks so much Jim, I appreciate you being on the show today. Jim – Thank you Rich, it’s been a joy talking to you. Bye.